In the 1950s, only people with excellent credit (like successful businessmen) could get a Diners or Amex card (the pioneers of credit cards). 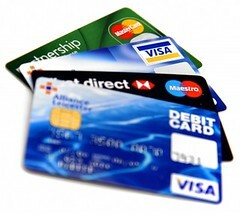 Because of this, credit cards were a status symbol, a prestige – if you had one, you were cool! The initial credit card model was that companies made their money from membership fees and sales commissions, and got mad if you didn’t pay off your bill each month. Then in the 1960s, banks jumped in and starting offering credit cards too. By the end of the decade, almost every bank were issuing charge cards. However, their business model was different – they generated most of their revenue from interest charges and late charges. In short, they aren’t interested in getting you to pay off your bill in full each month, as they earn more the longer you take to pay your bill off. Banks love for you to carry a balance. In fact, minimum payments have been lowered, incentives were offered, grace periods were lowered, annual fees can be waived. Although credit cards are one of the 5 ‘C’s, these days, anyone can own a platinum card. If you have a $12,000 credit card debt, never charge a single dime to the card after, and only pay the minimum due, it would take 400 monthly payments (33 years and 4 months) to pay off everything. At an interest of 18% pa, it would cost you a total of $29,616 to pay off the $12,000 you charged to the card! You can’t finish rich if you’re carrying credit card debt. Borrow money to make money, not to lose it. 1) There is a difference between good debt, and bad debt. The only time borrowing makes sense is when you do it to buy something that can go up in value, like a house. 2) Treat your credit card like cash/nets. If you don’t have the cash or money in the bank, don’t charge it. 3) Use the bank. Don’t let them use you. The only reason you should have a credit card is to earn points or get cash-backs and discounts, and not treat it as a loan for money you don’t have. I love credit cards that are tied to a bank account. What I do is charge it for the points/cash-back, then pay it off at whenever I log on to internet-banking. * summarized from “Start Late Finish Rich” by David Bach, Chapter 4. Book borrowed courtesy of the National Library. This entry was posted on Thursday, March 12th, 2009 at 4:38 pm and is filed under Banking, Book Reviews, Credit, Singapore Watch ver 2.0. You can follow any responses to this entry through the RSS 2.0 feed. You can leave a response, or trackback from your own site.